Many baked goods call for nuts from walnuts to pecans, pistachios to macadamias and whatever other nuts strike the recipe developer’s fancy. Weighing nuts is the most precise way to measure, yet many recipes (most American recipes for sure) call for nuts by volume such as 1 cup or 1/2 cup. 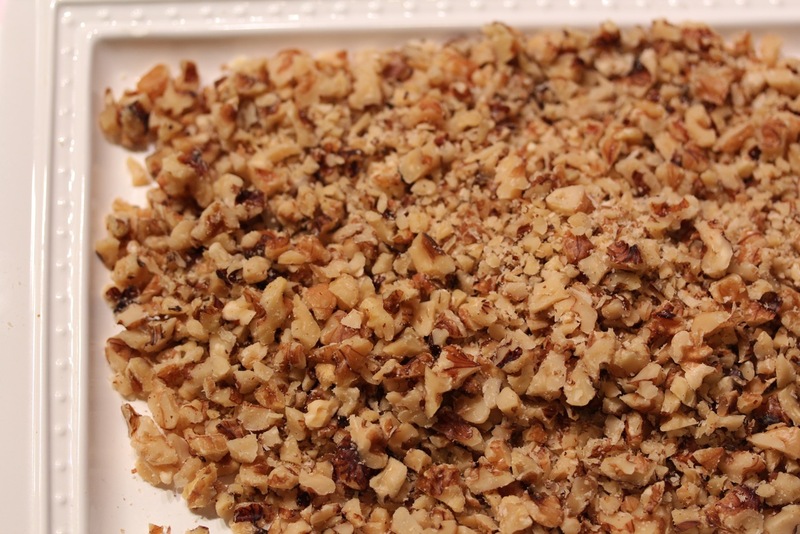 But read the recipe more carefully….does it say 1 cup chopped pecans, or 1 cup pecan halves, chopped. These are different measurements. The tiny pieces of chopped pecans will fill up he space more densely, yielding a heavier “cup”, if one were to weigh it, than the 1 cup of the large pecan halves. These larger pieces do not nest together very well and there will be more air spaces. When I write recipes, I take care in writing what I mean and meaning what I write, so follow my recommendations for the correct volume measurements. (And, of course, do not forget to use your high quality measuring cups). 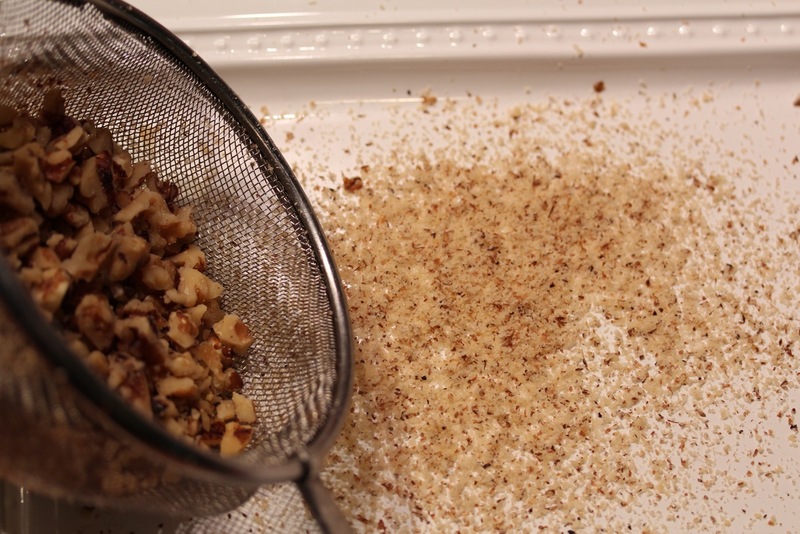 If the recipe calls for whole nuts, or halves, then all you have to do is use them as is. If they are to be chopped, make sure to chop appropriately. If the recipe recommends toasted nuts, I toast them as whole or halves, and always allow to cool completely before chopping. Toasting brings the natural oils to the surface. Upon cooling the nuts will re-absorb and re-distribute for the best flavor and texture. “Coarsely chopped” means just that. Place on chopping board, use a chef’s knife and chop them up a bit. The sizes will remain fairly large and irregular. Since nuts vary so in size (think of a jumbo pecan vs. a pistachio) it is hard to give measurements. What I try to do is chop most of them at least in half, and then half of those in half again. “Chopped” is one step further so that the nuts are fairly evenly chopped – all of them broken down to about one-quarter of their size. “Finely chopped” means basically chopping them as finely as possible. Once your nuts are chopped you might end up with a bunch of powdery bits. Look at this photo below of some fairly finely chopped nuts. Towards the center of the image you can see how there are some powdery bits on top of the pile. It’s an easy way to remove the powdery part and the texture of your cookies, bars and cakes will thank you. I just toss it away (there usually isn’t very much, so it doesn’t feel wasteful – or use it to top your oatmeal or yogurt). Next step smaller and we are talking about ground nuts, which I do by pulsing in the food processor. They can be “Ground” (one step below the “finely chopped”), or “Finely ground”, which is basically grinding them as fine as possible but stopping short of making nut butter. My parting words to you, now that you are armed with all sorts of nutty news, is to remind you to buy your nuts as you need them to make sure they are as fresh as possible. Store extra in the refrigerator if using within a week or two – in the freezer for longer. Always in an airtight container. Enjoy! To try your hand at a nutty recipe, try my Pistachio Butterballs or Thumbprint Cookies.